storage or retrieval system, without the express written permission of the publisher. Our People Make The Diﬀerence No maer how remote your producon shoot, Loon Security is there for your protecon. Loon has over 30 years on-site security experience in the Gulf South region, including security for the ﬁlm industry. We have provided set and asset protecon for the ﬁlm producons: Oblivion, The Host, Philly Kid, Pitch Perfect, The Dukes of Hazzard, HBO series True Blood, Bale: Los Angeles, 9th Ward and Universal Soldier 4: Day of Reckoning. Whatever your security needs are for your next producon, Loon is there to provide excellence in everything we do. Available in Louisiana, Mississippi and Texas producon locaons. 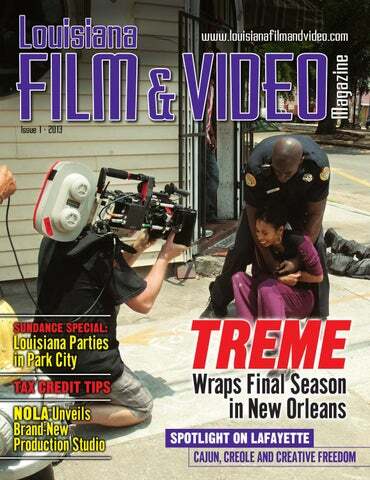 (L-R) Creators Eric Overmyer and David Simon on the set of Treme. (L-R) Producer Eric Overmyer and director Jim McKay working on the set. From season one, the crew prepares a shot with actor John Goodman (far left in the Hawaiian shirt). Music is an integral part of the series. (clockwise from foreground) Wendell Pierce, David Simon, Eric Overmyer, and Glen David Andrews take a break between shots. and Nina (Kostroff-Noble) started in Baltimore when working on The Wire. HBO has been generous in being a partner on this… It just feels right to give back to those organizations, especially for our show, which is about that culture and tradition. And, as you know, since Wendell Pierce’s character on the show started teaching band in middle school, many of those kids are involved in the Roots of Music program outside of school and their work on the show. In New Orleans, everybody knows everybody, so in a way, everyone will benefit.” Reflects Overmyer, “I think we’ve done some good work here. We will be shooting on Mardi Gras day for our very last final day, which just seems kind of fitting. This will be (Treme’s) fourth carnival, and I think we’ve done a little bit of filming on every Mardi Gras day. Mardi Gras has been part of our storyline every season, and since this is just a half season, it will be our final episode. I’m really looking forward to Mardi Gras. This may be my last carnival for a while.” Treme and HBO have done good work in New Orleans. In addition to their charitable work, they’ve pumped money into the local economy with companies that provide production support, as well as jobs for crew and day players. “We’re a relatively inexpensive show for HBO, partly because of the kind of show we are. We don’t do big sets or special effects. The tax credit is a big offset,” says Overmyer. Scouting Sco outing fo for or your next n pro production? oduction?? Chesley Heymsfield, LIFF executive director, and Valentina Caniglia, award-winning cinematographer. Dana Williams, the mayor of Park City, with LIFF’s parade queen Shanna Forrestall. Shanna’s dress by Nola designer John Joseph Delgadillo, jewelry by Shane Scallen of Sellfish Design. “We defrosted Main Street with Louisiana hot saucy-ness.” — Conquistador Alexander Antebi, LIFF Parade King musicians like Jon Batiste and Stay Human to lead your parade, and then you feed them delectable Louisiana cuisine from our very own chef from IPO, Chris Wadsworth, and local food blogger Jay Ducote. To the tune of “You are My Sunshine,” the second line eventually made it to the front door of Cisero’s, with Park City mayor Dana Liza Kelso of the Baton Rouge Film Commission and Neil Wells of Vudeaux Entertainment. importantly, I spoke with several executives who expressed interest in coming to our city with future productions. Armed with our beautiful office ‘brag book,’ Film Baton Rouge, I was able to market our film-friendly city, with its very own purpose-built soundstages, as the fully capable and experienced ‘sister’ to New Orleans. I am looking forward to following up with many of these individuals soon. Today, as I left Park City, I grabbed the local paper. Imagine my excitement when I saw a front page picture of our very own Mardi Gras parade lined up outside of our party. Representing the Baton Rouge Film Commission at Sundance was truly an honor and I can’t wait to do it again next year. Mission accomplished. CAJUN, CREOLE AND CREATIVE FREEDOM Lafayette's diverse locations include (clockwise from top) River Ranch, the swamp at University of Louisiana at Lafayette, and Oak Alley. here is a place, one of few in the U.S., with its own true, unique culture, scenery and people. A culture that greets you at the door and makes you the best meal you have ever had. Where kindness, support and hard work are not qualities that are hoped for, but traits that are expected. This one-of-a-kind place is Lafayette, Louisiana. Lafayette is one of the leading cities in the country in technology, thanks in large part to LITE. DP Bobby Holbrook on the set of one of his many projects. Still from recent Lafayette-shot series Vamped. Paul and Lulu Hilliard University Art Museum, located at the University of Louisiana at Lafayette. The SyFy Channel movie Weather Wars filmed in Lafayette in 2011. Holbrook Multi-Media, a 35-year-old major production house in Lafayette. Working on set since he was 7 has allowed him to be involved in most every aspect of the business as producer, grip, gaffer, shooter, DP, director, editor and colorist on countless documentaries, indie and feature films, long form presentations and hundreds of regional and national TV commercials. Bobby spends most of his days editing, color grading, and shooting and operating his Steadicam & 35-ft. Jimmy Jib, but recently, his focus has included reviewing all types of cinema cameras, from DSLRs to the highest end 4K and now 8K units. Currently, Bobby is not only advancing his own skills, but he is working on the advancement of the infrastructure and technology of Holbrook Multi-Media. uying Louisiana tax credits is a relatively easy way to reduce your state income tax liability. The following is a sampling of issues you and your legal or tax professional should discuss when making the decision to purchase tax credits. The credits must be earned in compliance with applicable statutory and regulatory requirements. In certain cases, this may mean the credits are “certified” by a State department, and in some cases your professional may have to review applicable documentation to determine if the credits have been earned by the seller. Put it in writing. Put the details of your agreement with the seller in writing. The seller should warrant that it has neither claimed on its own behalf nor conveyed to any other transferee the tax credits transferred to you. Notify the State. Most statutes require state notification of the credit transfer within 30 days of the transaction, but review the statute and rules governing the particular type of credit being purchased to ensure your compliance with the law. Copies of the transfer document and state tax credit certification letter, if applicable, are typically sent in as well. Some credits, like the motion picture tax credits, also require a processing fee for each transfer. Consider transferability limits. Some tax credits have a limit on the number of times they can be transferred. For example, while motion picture credits are not limited, live performance credits may only be transferred once to one transferee. Always check the law and verify with the seller to ensure that you are within any transfer limits. LFV Meg is an attorney in New Orleans at the law firm of Adams and Reese LLP, with experience in media and entertainment law and tax credit transactions. This article is intended for general information purposes only and is based on the laws and regulations in effect at the time of creation, which are subject to change. Application of the information reported herein to particular facts or circumstances should be analyzed by legal counsel. Motion Picture Studio Mechanics of Louisiana & Southern Mississippi Louisiana motion picture tax incentives aren’t news. They’re a success story. IATSE Local 478 now has 1,100 members and we’re still growing. These dedicated men and women work in various crafts in the art department, construction, crafts services, electric, first aid, greens, grip, locations, paint, props, set dressing, sound, special effects, video assist and wardrobe. We have one of the strongest and longest lasting incentives systems around which means these professionals have worked on hundreds of movies over more than ten years. They bring experience to your production. They raise the bar and lower your bottom line. If you’re looking for your next location, look no more. e are not like the other studios. We are more like a Hollywood studio. We are a full-service creative entity rather than just a building to rent space from,” says Tom Conrad, president of New Orleans Motion Picture Studios (NOMPS). want to shoot their films here. There are currently more films being shot locally right now than in Hollywood and New York.” Conrad is no stranger to New Orleans. Of his 40-plus years of experience in the film industry, he spent 10 years as a casting director in the NOLA area. Because of his firsthand insight into the exponential growth of the city’s infrastructure, Conrad worked for five years to land the lease on this historic building on the West Bank. From concept to completion... The Adams and Reese Entertainment and New Media team covers the legal arena within the entertainment, film, music, and book industries including intellectual property, technology, and new media. From concept to completion, we are advocates for our clients in contract preparation and negotiations as well as in purchasing, selling, licensing, protecting, and enforcing intellectual properties. All photos: To celebrate the grand opening of NOMPS, the studio hosted a major open house party. On Thursday, January 10, hundreds gathered for a memorable grand opening of one of the largest and most functional film studios in the state. “It was probably one of the best parties ever. At least that’s what people were saying,” says studio president Tom Conrad. “Everywhere you looked there was something different.” Owners Blaine Kern, Jr. and Conrad threw a party that rivals the best of Mardi Gras balls. Complete with live performances, a DJ, flashing lights, carnival floats and festive costumes, the event was bursting with the vibrancy of New Orleans. Conrad’s wife, a Chinese film star, performed the ancient art of Face Changing and Opera Sleeve dancing. Food and spirits were plentiful, energy was high, and guests left the party with a sense of awe at the grandiosity of the event. What was once a Mardi Gras landmark in New Orleans has now been transformed into a top-of-the-line film and event studio. This opening night bash is sure to mark the beginning of a new landmark in the Louisiana film industry. L&R IS LICENSED IN THE FOLLOWING STATES LOUISIANA CALIFORNIA COLORADO MISSISSIPPI ARIZONA ALABAMA MISSOURI TEXAS NEW MEXICO ARKANSAS TENNESSEE FLORIDA VIRGINIA MARYLAND WASHINGTON, D.C. WE CAN OBTAIN LICENSING IN ALL 50 STATES. TO LEARN MORE CALL (504) 943-3191. WWW.LRSECURITY.COM L&R SECURITY SERVICES, INC.
Attendees flock to see the latest in smart watch technology on the CES show floor. to start releasing under their own brand last year. “Hisense has shown that it is not only capable, but ready to jump into the UHD market with televisions that offer every feature a consumer could ask for today, but at a price that won’t cause sticker shock.” Hisense plans to release 4K TVs this spring with prices starting under $10,000. While most consumers probably won’t see 4K television sets in their home anytime soon, the proliferation of 4K sets by manufacturers has serious implications for filmmakers. In the same way that digital films shot on SD now have a very hard time finding buyers, films shot in HD or even 2K may soon experience similar issues. Filmmakers should expect to see an increasing market demand over the next three years for films shot on 4K, as well as 3D films shot on 4K. Sony has already started distributing films in 4K with their 4K TV that started shipping out late last year. North American VP of Hisense presents sales figures and their latest technology advancements. Movies on Blu-ray typically automatically sync 2nd screen content to an external device, whereas live broadcasting will use an audio cue. +!6,2/(&!0PPTR ,* TO LEARN MORE, VISIT AUDUBONINSTITUTE.ORG. Over 40 yyears Over O ears industr iindustry d t y experie experience ience pr providing oviding idi affection afffeection trained domestic & ex exotic xotic animals ffor or or the tele television v vision & ﬁlm ind industries. dustries. We W eo own wn our o own own animals animalls and provide provide trainers, trainers, w wrangler wranglers, g s,, and coor coordinators. dinators. ungry for clarification? In this edition of Tech Tips is a basic explanation of RAW, LOG and LUTs, Louisiana-style, and how it parallels with gumbo. When making a gumbo, you start off with raw ingredients, you cook up the foundation of the gumbo (roux), and then you decide what flavor of gumbo it’s going to be (i.e. chicken and sausage, seafood, shrimp and okra, etc.). RAW, LOG and LUTs are the same. You start off with raw sensor data, then you apply a foundation to that information to give you an image (LOG encoding), and then you apply flavor to the image (LUTs). It’s that simple... Mais ca c’est bon! just as there are many types of roux (dark, medium, blonde, dry). They all start the same and end up different. So now we have an image we can view, but it’s still flat. Why? Because LOG encoding simply compresses the highlights and expands the shadows to make the most efficient use of bandwidth and it also mimics how the human eye works. In addition, it leaves huge possibilities for color grading. Now it’s time to kick it up and decide what flavor of gumbo we want... Here come the LUTs. A look at an image in the RAW, LOG, and LUT stages. image and add gamma space, contrast, saturation, hue, lift, gamma and gain values, and more. Originally, LUTs were technical translations that converted Rec709 to P3, Cineprint, D65 and others. ‘Looks’ were files created by the cinematographer and would be applied regardless of where the final image was going. Cinema for a New Age: Going HD Panel Discussion Making the Cut: Intro to Editing Class with instructor Christopher C. Brown. (left to right) NOVAC’s Ashley Charbonnet (director of programs), Darcy McKinnon (executive director) and Abigail Levner (membership and programs coordinator). he New Orleans Video Access Center is a non-profit organization with a mission to help cultivate a sustainable local film community. Forty years in operation, NOVAC is the longest continuously running media-arts 501(c)(3) nonprofit in the Southeastern U.S., and is an extraordinary asset to the New Orleans production community. Read on for more: NOVAC. What does NOVAC do? NOVAC serves the film community immeasurably through educational programs, career development, community outreach, independent production, special events and a wide range of resources. 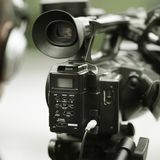 The organization provides workforce training at no cost for crucial subjects like cinematography, screenwriting, grip and electric, and various technical training. In addition to workforce training, NOVAC holds intensive workshops called ‘pop-ups’ at an affordable rate for those looking to further expand their knowledge and creative repertoire. Aside from an active effort to promote education in the community, NOVAC is highly involved in the production of local independent film. In providing access to fiscal sponsorship, low-cost equipment, editing software and rental space, NOVAC has become an indispensable resource for independent filmmakers in the New Orleans area. and social action tool for a disenfranchised community. By forming a broad based, racially balanced coalition with the Free Southern Theater, the Urban League and Tulane University, NOVAC’s efforts led to the formation of a mayoral task force to create a plan for involving the community in cable television. “The nature of our archives says a lot about what we came from,” says director of programs, Ashley Charbonnet. “Forty years ago we were somewhat of a grass-roots organization. It was a period when filmmakers were telling their own stories about the community. There were a lot of activist documentaries and Members of NOVAC’s PA Training program. we shifted gears towards workforce training.” NOVAC has continued its efforts to involve racially and economically diverse communities in television production and community programming. In January 2005, NOVAC and the Tipitina’s Foundation of New Orleans Music Office partnered to offer video editing, music recording, mixing, and other training services for video producers, filmmakers and musicians. NOVAC INTERVIEWS DIEGO MARTINEZ On Tuesday, January 15, the New Orleans Video Access Center (NOVAC) held an intimate conversation with the president of Millennium Studios, Diego Martinez. Local filmmakers and film enthusiasts gathered at the Contemporary Arts Center for an in-depth look into the locally involved and independent film studio. Attendees took away invaluable information on film marketing, distribution and working in a changing climate, among other topics. “Distribution is not always theatrical,” said Martinez. “People think that if it is not theatrical, then it isn’t successful. This just isn’t true.” Adaptability, no matter where you are, was a common theme of the discussion. Said interviewer and NOVAC’s director of programs, Ashley Charbonnet, “The key is being able to adapt to a changing market. Funding models change. Being able to adapt on a local level, regardless of tax incentives, is essential.” Added the Louisiana-grown Martinez, “I want to make sure the industry is here [in Louisiana] in the future for me and for everyone.” To close the discussion, Martinez was asked his pick for the Oscars, and with no hesitation he responded with Beasts of the Southern Wild. The night was capped off with a mouthwatering spread of Sucre chocolates and, of course, some fundamental networking. NOVAC’s Ashley Charbonnet interviews Diego Martinez of Millennium Studios. How can I get involved? “Come to a Third Thursday and meet filmmakers and NOVAC members,” says Charbonnet. “It all starts with having the access to people and networking. Our tagline is ‘connecting filmmakers to the community since 1992’ and this is a great place to start.” As the name implies, ‘Third Thursday’ socials are held on the third Thursday of every month at various locations in the New Orleans area. LFV For more information about NOVAC and NOVAC events, please visit www.novacvideo.org. when in the area for film or entertainment. Forget having to pick up stakes and bring your unit in to a land-based service shop—call Leo’s RV Service and they’ll come to you. LFV For more information, visit www.leosrvservice.com or call 225-772-4305. Forget having to bring your unit in to a land-based service shop—call Leo’s RV Service and they’ll come to you. BRANDS: AC Delco, Exide, Universal Power Group, YUASA, Motorcross, Gates Hawker, Poloroid, Sanyo, Duracell Procell, Cyclone, Panasonic, Saft, Tadiran, Schumacher Chargers, Cadnica, Hawker, Powersonic, Enersys, Eagle Picher, Ultra Life, Midtronics, Autometer, DEKA, Associated Equipment, and many more! rom the days of Lassie, animal actors have always been an integral part of filmmaking. Their endearing human-like qualities are nothing short of amazing, and continue to be popular among viewers. imecode:NOLA’s first annual film festival, FF ONE, was a huge success. The inaugural fest spanned four days across six venues last fall. The opening night bash was held at Siberia and featured the Southern premiere of burlesque documentary Satan’s Angel, from director Joshua Dragotta, playing to a packed house. The following night featured Timecode’s 2nd annual Super 8 One Reel Competition, where Phil and Rhonda Vigeant of Pro8mm presented prizes to the three best Super 8 films, including a brand new RhondaCam to local filmmaker Bruno Doria. All weekend long, Second Line Stages hosted filmmaker workshops covering everything from pre- to post-production, technical, creative, business, and financial aspects of the film industry. Metairie’s own Ken Mowe left his adopted city of Los Angeles to come home and partner with Avid to teach a master editing class using his own MTV award-winning music videos, including Gnarls Barkley’s “Crazy” and “Smiley Faces.” Other highlights were the indie director’s panel, with awardwinning directors Laurie Collyer and Bill Ross, and Pro8mm’s Super 8 workshop. Saturday night was the biggest event of FF A Q&A with Satan’s Angel director Joshua Dragotta (left). FF ONE’s opening night bash was held at Siberia and featured the burlesque documentary Satan’s Angel. ONE with the premiere of Where y’at? (hello), a feature film made up of 15 short films by 15 local directors, all taking place in different New Orleans neighborhoods. Over 300 people packed into One Eyed Jack’s to celebrate one of the largest collaborations of New Orleans filmmakers ever on a single project. It told the story of New Orleans through its varied and unique neighborhoods and characters, and brought a huge sense of pride to the local filmmaking community. The festival’s final day, Sunday, included the Docs in the Park series at NOMA, featuring The Farm, a legendary Louisiana doc on Angola State Prison, and 45365, from Tchoupitoulas director Bill Ross. Both screenings were followed by Q&A sessions, the former with exinmate Ashanti Witherspoon and the latter with Ross. The Sunday night closing screening and party ended with travel films by the Nomading Film Fest (NOFF) at the Lost Love Lounge. Above: Over 300 people packed into One Eyed Jack’s for the premiere of Where y’at? (hello), a feature film made up of 15 short films by 15 local directors. Below: Ashanti Witherspoon (right) participates in a Q&A with Timecode:NOLA’s Jackie Shulman after a screening of The Farm. The screening of Satan’s Angel also featured a live burlesque performance. BRIEFS 2013 FEAR FÊTE HORROR FILM FESTIVAL CALLS FOR ENTRIES The third annual Fear Fête Horror Film Festival has opened its early entry period for horror film submissions. During the early submission period, the festival invites all filmmakers from around the world to submit their independent horror films for free until February 15, 2013. Fear Fête is Louisiana’s premier horror film festival, showcasing many of the world’s best independent horror films over the course of three nights in October. Baton Rouge, Louisiana, will host the 2013 festival once again, showcasing short and feature-length films in sub-genre categories of horror. “We are stoked to be kicking off another year of offering film submissions for the 2013 festival. We look forward to seeing all the great films submitted and hope to smash another record for number of submissions once again this year,” stated Derek Morris, Executive Director for Fear Fête. The festival will be held in October 2013. Dates and venue will be announced at a later date. Official entry rules and the entry form can be accessed at www.fearfete.com. The deadline for all submissions for the 2013 Fear Fête Horror Film Festival is June 28, 2013. RB Livestock Company Providing Wrangling and Livestock for the Movie Industry for over 32 Years. Whether it for Feature Films, Commercials, or Photo Shoots we have the knowledge and experience to help with all your project needs. We supply both large and small animals plus some exotics. We offer wrangling, training, and rentals.